SmartBots allows you to control your own Bot giving you full control over an avatar (movement, appearance and behavior) you create using the SmartBots Personal Bot HUD. We host the bots on our servers, and you don't have to worry about uptime: the average bot uptime is 100-150 hours with 1 minute relogs. If your region restarts, the bot will automatically teleport back to region and sit on a selected object. SmartBots HUD to remotely control your bot: teleport, walk, sit and change options. Bot Live Chat web interface can be used to send and receive bot's Instant Messages. Use Bot Pose Stand to animate your bot. The bot's appearance, attachments, AOs can be setup using any SL viewer. Support all kinds of AO (animation over-rider). Usage: greeter, notice sender, AI support. 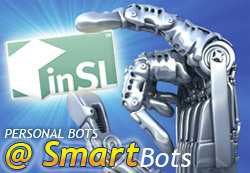 Includes all SmartBots services: direct inviter, notices, chat, translator. Supports all AdminBot commands, all HTTP API calls. Usage: mannequin, dance model, beautification. Does not support additional services (can be a member of Second Life groups, though). Supports some HTTP API calls (movement, teleport, wearables). Read More about the types of personal bots here.